Well, I have seen some fabulous work with digital stamps. I don't think that I'll ever become a full-time digital stamper, but heck - I'm willing to try it out. I still like the feel of a stamp in my hands. I happened to check up on a site I haven't been to in a while, Pink Cat Studios. They are raising funds for the Make a Wish Foundation in honor of a little boy who left this world due to his battle with neauroblastoma. 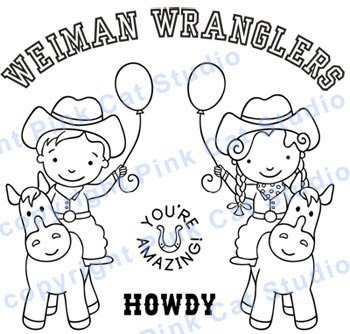 So I thought, what a better way to try out digital, than to buy some Wranglers. Just $6 for two images and two sentiments. The proceeds go to the Make A Wish Foundation. I have downloaded my new digistamps & can't wait to get to doing something with them! Will have to muddle through my stash at home and see what cowboy/girl-ish papers and embellies I might have lying around! Stay tuned! I promise to have a card created with these images! Really! I know, its been so long since I've posted any cards, but I promise this time! Well butter my biscuits! A blog post from Karen! LOL! hello, I am offering blog candy on my blog, check it out!